A business thank you letter or a letter of thank you after a job interview is one of the most under-utilized ways of obtaining employment there is. Send them a thank you letter for the fact that they called you in the first place. They invited you because they have a strong curiosity concerning you. I always look at an interview as mine to lose. They wouldn’t have me pass through their doors if there wasn’t a high degree of interest. The fact that they considered you in the first place for a job interview should never go unnoticed and a business thank you letter should never be overlooked. I believe that it is one of many qualifiers considered when choosing an applicant for the job. I would personally believe that if they don’t appreciate my calling them in then their value as a team member is diminished. 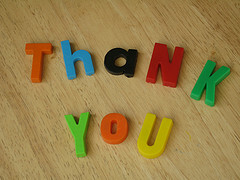 Not sending a letter of thank you shows that he or she shows a lack of interest in the job and an absence of diligence. Basically, they are not the right candidate. Perseverance is a trait most desired by many employers. It is a handy quality especially in sales where rejection is common. If you are not a strong consideration for the job your tenacity may help change their mind. Like the suggestion in our ‘cover page design’ article you will want to write as if you are speaking to them in person. Don’t’ try to get too fancy or make it flowery. Just write in certain, easy to understand terms. You are kissing up to them but don’t make it obvious. You don’t have to send the most astute note or come up with clever sayings. Just let them know you appreciate their considering you. Send thank you notes after each of multiple interviews and send one to each person with which you meet. Send a letter of thank you after a phone interview. It is truly a thank you letter for acceptance because they took the time to talk with you. Don’t waste any time in getting your letter of thank you to them. When leaving the interview ask the receptionist for the interviewer’s email. You can let them know of your intentions of wanting to write and give thanks. If they hesitate to give out the email address then be sure to get a letter to them as soon as possible. Overnight delivery is appropriate. Where possible, deliver it in person. There is much involved in obtaining gainful employment. If it were easy everybody would be doing it. David Barth believes that quality of life through gainful employment with a knowledge of how to write a Business Thank You Letter is most important. Visit him at http://jobstoworkfromhomeonline.com for more advice on avoiding unemployment. Is it appropriate to write a thank you note before you have had an interview. Saying thank you for considering my application? Eh… prolly not. Comes out a bit too eager.